The Citroën Traction Avant was an automobile produced by the French manufacturer Citroën. About 760,000 units were manufactured from 1934 to 1957. The car introduced the use of an arc-welded monocoque frame, where other cars of the era were based on a frame onto which the body ("coachwork") was built. Monocoque construction results in a lighter vehicle, and is now used for virtually all car construction, although body-on-frame construction is still suitable for larger vehicles such as trucks. This method of construction was viewed with great suspicion in many quarters, with doubts about its strength. A type of crash test was developed, taking the form of driving the car off a cliff, to illustrate its great inherent resilience. The novel design made the car seem very low-slung relative to its contemporaries — the Traction Avant always possessed a unique look, which went from appearing rakish in 1934 to familiar and somewhat old fashioned by 1955. The suspension was very advanced for the car's era. The front wheels were independently sprung, using a torsion bar and wishbone suspension arrangement, where most contemporaries used live axle and cart-type leaf spring designs. The rear suspension was a simple steel beam axle and Panhard rod with unequal trailing arms, to allow the two torsion bars to run parallel to each other, across the car's width. Since it was considerably lighter than "conventional" designs of the era, it was capable of 100 km/h (62 mph), very fast for the era, and using only 10 litres of gasoline per 100 km (24 mpg). The original models were a small saloon with a 1303 cc engine. This model was called the 7A, which was succeeded in June 1934 by the 7B and 7C with higher powered engines of 1529 and 1628 cc respectively. Later models were the 11, which had a four-cylinder 1911 cc engine, and the 15, which had a 2867 cc six-cylinder engine. The numbers refer to the French fiscal tax horsepower rating CV (thus the 11 was an 11CV, the 15 was 15 CV). The 11 was built in two versions, the 11L ("légère", or "light"), which was the same size as the 7CV, and the normal model 11, which had a longer wheelbase. Citroën planned two variants that never entered production, since there was not enough funding available to develop them, except as running prototype vehicles. One was an automatic transmission-equipped model and the other was a 22CV model with a large V8 engine. In addition to the 4-door body, the car was also produced as a 2-door coupé with a rumble seat, as a convertible and as an extended length model with three rows of seats. There was even a hatchback-type Commerciale variant, in 1939, well ahead of its time, in which the tailgate was in two halves, the lower of which carried the spare wheel with the upper opening up to roof level. A one-piece top-hinged tailgate was introduced when the Commerciale resumed production in 1954 after being suspended during World War II. The Traction Avant used a longitudinal, front wheel drive layout, with the transmission ahead of the differential and front axle, and the engine behind it, resulting in a very favorable location for the center of gravity of the vehicle, aiding the car's advanced handling characteristics. This layout was later carried forward to the Citroën DS and Citroën SM. The gear change was set in the dashboard, with the lever protruding through a vertical, H-shaped gate. Because this vertical orientation could have resulted in the car dropping out of gear when the lever was in the upper positions (i.e. second or reverse gears), the gear shift mechanism was locked when the mechanical clutch was engaged and released when the clutch pedal was depressed. The result of this layout, along with pendant pedals, umbrella-type handbrake control and front bench seats, was a very spacious interior, with a flat and unobstructed floor. Left-hand drive versions were built in Paris, France and Forest, Belgium, and right-hand drive cars were built in Slough, United Kingdom. The Slough verson of the 11L was called the Light Fifteen and the long wheelbase 11 was called the Big Fifteen. This confusing terminology referred to the British fiscal tax rating of the time, which was higher than the French, so the 11CV engine was 15HP in England. The 15CV model was called "Big Six" in reference to its 6 cylinder engine. They were equipped with the leather seats and wooden dashboards popular in the UK, had a 12-volt electrical system and were distinguished by a different radiator grille and different bumpers (fenders). Some models also had a sliding sunroof. 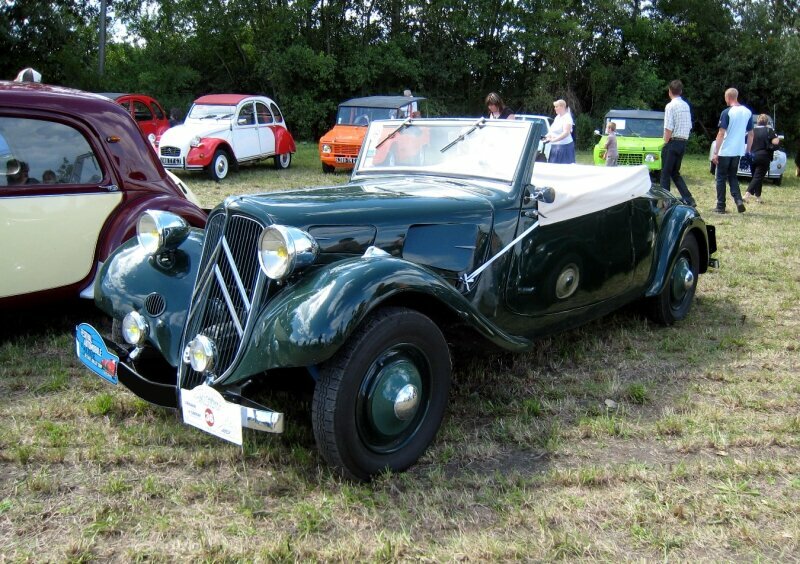 The development costs of the Traction Avant were very high and Citroën declared bankruptcy in 1934. The largest creditor was Michelin, who then owned Citroën from 1934 until 1976. Under Michelin, Citroën was run as a research laboratory, a test bed for their radial tires and new automotive technologies. In 1954 Citroën's experiments with hydropneumatic technology produced its first result, the "15H"—a variant of the 6-cylinder model 15 with a self-leveling, height-adjustable rear suspension, a field trial for the revolutionary DS released the following year. Production of the Traction Avant ended in July 1957; over 23 years, 759,111 were built, including 26,400 assembled in Slough (GB), 31,750 assembled in Forest (Belgium) and 1,823 assembled at Köln in Germany. The total reflects the production stoppage during World War II.